Ards Arts Centre, Conway Square, Newtownards is hosting this year’s Creative Peninsula Craft Fayre on Friday December 1 and Saturday December 2. The array of local craft makers and artists will give you the opportunity to purchase a range of unique handcrafted products. 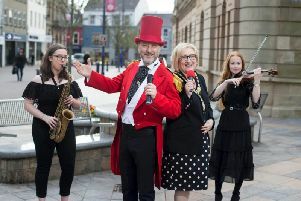 The fayre, now in its fifth year, is organised by Ards Crafts, Ards and North Down Borough Council, giving the local craftmakers and artists a platform to exhibit their skills and products. The fayre commences on Friday December 1 and continues on Saturday December 2, 10am-5pm both days. Admission is free and everyone is welcome to join the collection of craftmakers and artists in the galleries of the Arts Centre. On Friday harpist Ruth Corry will be performing between noon and 1pm. On Saturday there will be a performance by Regent House School’s String Octet, 3-4pm. They will be covering a wide repertoire including Christmas favourites to get you into the festive mood. The event is open to all the family - children will be delighted to meet friendly stilt walkers ‘Valentine Winterbottom’ and ‘the Snow Queen’ on the Saturday, 11.30-1.30pm. Further information on the event can be found on visitardsandnorthdown.com/christmas or call 02891 826 846.